Anybody can get strep throat, but it mainly occurs in kids between the ages of 5 and 15. Most cases of strep throat happen during the school year when kids are in close contact. Strep throat is the cause of 37% of sore throats among children and 5-15% of sore throats in adults. Strep throat is caused by bacteria, which are spread through coughing, sneezing, and shaking hands. Make sure your child knows proper hand washing techniques to avoid getting sick. Even if a child is not sick, he or she can still carry the strep throat bacteria. So how can you tell if you or your child has strep throat? If you are experiencing some of these symptoms, you may have strep throat. 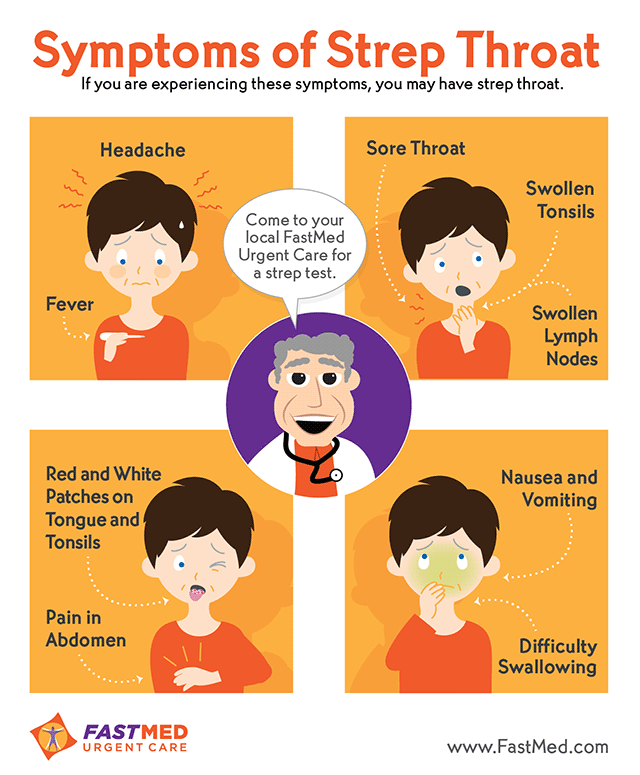 Come to your local FastMed Urgent Care for a strep test so we can quickly find out if you are suffering from strep throat. If you do have an infection, we’ll prescribe antibiotics that will decrease the duration of the symptoms and help you recover more rapidly. Make sure that you take the full course of antibiotics even if your symptoms go away. Sometimes strep throat can lead to kidney infection and other complications. If you have strep throat, stay hydrated, and with some help from FastMed, you’ll be back to your old routine in no time! When Is a Cold the Flu? How Do You Treat a Sore Throat?